When drilling through the reservoir, the key is to minimize damaging reactions between the mud and the reservoir that lower the production possible from the well. If a well loses only 10% of its potential production rate due to avoidable damage from the mud, the cost to the operator in lost profit over the full life of the well will be large. Mud cost must be considered but only to choose between technically suitable systems. Therefore what should happen is that for each hole system, all technically suitable alternatives should be defined and then the cost of each can be compared for a final choice. Physical, rheological, and chemical characteristics can be defined for each hole section, leading to a list of requirements for the mud system of choice. Density. Primary control of downhole pressures is obtained with a mud of such density as to exert a greater hydrostatic pressure on the formation than exists within formation pores. The lower safe limit of mud density is calculated by the density to balance formation pore pressure, plus a small additional amount as a safety margin. Some formations require a minimum hydrostatic pressure to keep them stable. When a hole is drilled through a rock in the ground, the stresses in the surrounding rock will tend to push the rock into the hole. If mud hydrostatic pressure is kept high enough, it pushes back against the rock and so supports it. The required density gradient is likely to be something greater than that required to maintain well control. Losses or formation breakdown may be induced if the hydrostatic pressure plus circulating pressure losses exceed formation strength. Circulating pressure losses refer to the pressure necessary to force fluid to flow along a pipe or annulus. The pressure at the bottom of the well while circulating equals mud hydrostatic pressure plus the pressure required to force the mud to flow up the annulus. This extra pressure imposed while circulating along the open hole can be enough to fracture weak formations in some cases. A high mud density will give a reduced MAASP. This means that the well is less able to withstand a kick than with a lower mud density. The rate of penetration is generally reduced with higher weights due to chip hold down. Sticking in the hole becomes more likely at higher mud densities. Higher mud densities have higher solids content, and this will adversely affect mud rheology, possibly calling for more additives to control this. On balance, the correct density within this range of maximum and minimum will normally be closer to the lower limit. Fluid loss. The fluid loss property of a mud indicates how well the mud forms a seal against permeable formations. To test fluid loss, a sample of mud is placed inside a chamber, which has a standard filter at the bottom. The chamber is closed and 100 psi is exerted on the mud sample. Filtrate is squeezed through the filter into a container below, and wall cake builds up on the filter. The standard test measures the amount of filtrate collected in 30 minutes, with the thickness of the filter cake given in 1/32nds of an inch or in millimeters. A description of the filter cake might also be made, using descriptions such as hard, soft, tough, rubbery, firm, etc. Figure 1. shows a filter press, which is used to test the fluid loss. A high fluid loss mud will build up a thicker, stickier wall cake, which is likely to lead to problems such as pipe sticking in the hole. Ideally the mud should build up a thin, tough, and impermeable cake fairly quickly. The test for fluid loss is a comparative test. It does not indicate how much filtrate will actually be lost to the formation, or how thick the filter cake might actually become. These things depend on many factors, such as the actual pressure overbalance, the permeability of the downhole formation, and the effects of mud flow or pipe movement eroding the filter cake. Sand content. Sand is normally the most abrasive solid present in the mud, and a high sand content will increase wear on pumps, valves, and other equipment. However, all solids in the mud will contribute to mud abrasiveness. Sand content should be kept as low as possible by using the solids control equipment properly. The sand content is measured by passing a fixed volume of mud through a 200-mesh sieve into a marked glass container. The sand sits in the bottom, and the sand content is measured directly from the marks. Mud rheology. Rheology is the science of the deformation and flow of fluids. When discussing the rheology of fluids in the well (mud, cement, or brines), what is of interest is the relationship between how fast the fluid flows and the pressure required to maintain that flow rate (either in the pipe or in the annulus). The relationships between these properties will affect circulating pressures, surge and swab pressures, and hole cleaning ability. Surge and swab pressures occur when the drillstring is lowered in the hole and fluid is displaced upwards. This imposes temporary extra pressure on the hole and is called surge pressure. When the drillstring is lifted upwards, fluid has to flow downwards as a pressure drop or suction is created by the withdrawal of the steel volume. This causes a temporary pressure reduction on the hole and is called swab pressure. Hole cleaning ability refers to the ability of a drilling fluid to lift cuttings out of the hole at a certain flow rate. This ability is related to the fluid density and rheology. To fully specify a drilling fluid that must perform specific functions, the required rheology must also be defined. The rheology not only affects the relationship between flow rate and pressure, it also affects the flow rates at which the flow regimes change. At very low flow rates inside the pipe and annulus, the fluid will move with all parts of the fluid moving in the same direction and at roughly the same speed. 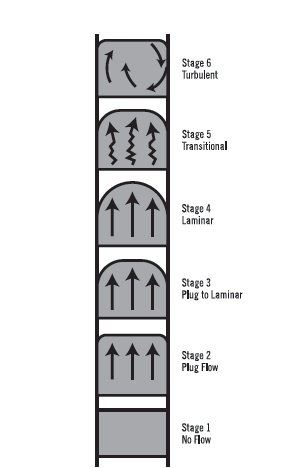 This is called plug flow, shown as “Stage 2” in figure 2. The chemical characteristics of the mud are mostly determined by wellbore stability considerations of the formations drilled through in a particular hole section. In addition, the mud should not damage the reservoir (reduce permeability), or at least damage done to reservoir permeability should be capable of being repaired (e.g., by using acid to remove plugging solids) or bypassed (explosive perforations penetrating through the damaged zone). A brief description of different problems and required chemical characteristics follows. Reactive shales. Many hole problems are caused by incompatibility between water and shales. This may be solved by using oil/water emulsion muds (with oil as the continuous phase) or 100% oil muds. This isolates water from the shales and so prevents hydration. Oil muds are becoming increasingly difficult to use in some areas due to environmental concerns and resulting government regulation changes. These muds are also expensive. Water-based muds may use various chemical inhibitors to control reactive shales, such as potassium chloride (KCl). KCl works by swapping places with sodium ions in the clay structure. As the potassium ion is smaller than the sodium ion, this causes the clay structure to shrink rather than expand. Clay crystals have electrostatic charges on their faces and edges. If a polymer molecule also has opposing charges along its length, the polymer sticks to the clay crystal and prevents water from reaching it. Another development is the use of soluble silicates in clay stabilization. These are soluble at high pH (alkaline; above pH 10) but precipitate out of solution as solids if the pH drops. As tiny amounts enter the pore spaces between crystals, the pH drops, and silicate precipitates and forms a barrier to further water penetration. Use of silicates seems to cause the clay to harden over time. As silicates are cheap, readily available, and environmentally friendly, their use will no doubt increase into the future. Salts. A nonsalt-saturated, water-based mud will leach out salt formations, causing extreme hole enlargement and possible cementing problems. This can be addressed by using either salt-saturated water mud or an oil-based mud. In complex salt sequences containing the most soluble potassium and magnesium salts, a mixed salt system is required to address the particular mix of salts present in the formation. The filtrate may contain fines (small solid particles) that bridge off the zone of invasion. If this zone is deep, perforations may not be able to penetrate completely through, and so the well will be less productive. If the fines were acid soluble, acid treatments may remedy the situation partially or completely. However, weighting agents and drilled solids are usually not acid soluble, so fluid loss control becomes very important in the production hole section. Acid-soluble materials (such as calcium carbonate) may be used. Chemical reaction between filtrate and formation fluids may produce solid precipitates or blocking emulsions. As noted above, if these are acid insoluble, the resulting damage may be permanent. The filtrate may react with the clays within the formation. Oilbased muds should give only low amounts of oil filtrate; no water should be present. Corrosion of downhole steel components. Tools and tubulars used in drilling, casing, and completing the well can be subject to corrosion by the mud. For most casing strings, mud is left in the annulus after the cement job, which will remain for the life of the well. Mud properties may change over time due to bacteriological action. This can produce H2S (especially when the mud contains organic additives) or low pH levels. Oil muds produce oil wetting of metal surfaces and will protect against CO2,H2S, and H2O corrosion. Hydrogen sulfide–related problems. Hydrogen sulfide (H2S) may enter the mud from a permeable formation, either as a kick or from within drilled cuttings. Apart from the extreme toxicity of this gas, it causes hydrogen embrittlement of most steels, which degrades tensile strength. If H2S is anticipated, an excess level of lime in the mud will help. The alkaline lime will help neutralize the acidic H2S. The reaction forms active sulfides such as CaS or Ca(HS)2, which will liberate H2S if exposed to a mild acid. Once H2S has been identified in the mud system, zinc oxide (ZnO) may be added. ZnO is an effective scavenger of H2S and active sulfide salts. This reacts to form stable zinc sulfide. It is not recommended to use ZnO before H2S is identified, as it will mask a slow entry of H2S into the system. Recommended concentration of ZnO is around 2 lb for each barrel of mud.